A favorite for pool sideboards, a panel from our Reef Mural moves up to the #1 position. Our new Classic Cement Tiles continue to be hot. This week a new pattern, Fez, takes the #2 spot and was recently featured in the Remodelista Daily blog. Our classic Portuguese Oporto Tile in 6" x 6" has been a top seller and rounds out what's hot this week with only a few pieces left in stock! Classic Fez Cement Tile (Colorway A) 8" x 8"
All tiles can be purchased online. If you have questions, please call us toll-free at 888.739.4972 (9-5 PST M-F) or info@AventeLLC.com. A small bathroom needs updating. The owner wants a classic look in a warm color scheme that works with the existing 1920's Spanish style bungalow in Los Angeles. With this in mind, we created a concept using some of our favorite cement tiles and ceramic tiles that were in stock. Below are the sketches from the designer's notebook. The bath is small, so we picked a large (8"x8") floor tile from our Classic Cement Tile line. The floor tile, Bordeaux, is a simple pattern and uses a warm pallet of Burgundy red and yellow that the owner loves. You get a really "large format feel" with cement tiles because you need four tiles to create the pattern. Large format tiles are ideal for a small bath and make it seem bigger. The small bath doesn't get a lot of natural light, so we picked a handcrafted cream color tile with a crackle finish from our Gossamer Tile Line. The soft crackle finish is translucent and bright against the cream tile. We recommend a beveled brick tile to add interest, depth and texture around the room at "wainscoting height." To tie-in the color scheme from the floor to the wall, create an accent strip. Pair the Cracked Ice liners in amber and burgundy—they work wonderfully together with the Gossamer Crackle. For the shower/tub surround, we used the same color tile, Cream Gossamer Crackle. However, to add tone-on-tone interest use a different size and pattern: 6"x6" tile on-point. This subtle effect works well in small places and for customers that want to maintain a basic color scheme. Here's a list of the tiles used for this project. It's your Avente Tile shopping list! Floor Tile: Bordeaux (Colorway B) Cement Tile 8" x 8"
Wall Tile: Gossamer Cream Crackle Tile Beveled (Edge) Brick 3" x 6"
Wall Accent Tile: Cracked Ice Burgundy Liner 1" x 8"
Wall Accent Tile: Cracked Ice Amber Liner 1" x 8"
Shower Tile: Gossamer Cream Crackle Tile 6" x 6"
I often hear that patterned cement tiles are "old fashioned" and can't create a contemporary look. It's one myth that I'd like to debunk. The Serengeti pattern from Avente's Classic Cement Tile collection provides an exotic, contemporary feel that is timeless in its classic two-color pallet. This dining room floor is an elegant and contemporary focal point for this resort restaurant. Notice how the tiles are "mismatched" so that the light color cream is juxtaposed to black in the neighboring tile. Compare to the Serengeti pattern shown below. Also, the pattern runs the entire room without a border. This bright corporate bathroom uses a classic Cuban Heritage Pattern in the bold, contemporary colors of Turquoise, Brown, and Caribbean Blue. The tile is used on the floor, wall, and ceiling for a very modern and cool feel. Here a border is used between the wall and floor joints to provide a boundary and transition. These two examples show cement tiles creating a contemporary style and mood. If you love cement tiles and want to use them in a contemporary setting, here's a few tips that might help. Limit your choices to a few colors. Choose simple patterns that use just a few colors in a contemporary pallet. Install patterns so they run to the edge of the room. Use a border at the edge of a room if you are installing the same pattern on vertical and horizontal surfaces to provide a transition. On simple geometric patterns, try "mismatching" the dark and light colors on neighboring tile. This works well for high-contrast tiles. 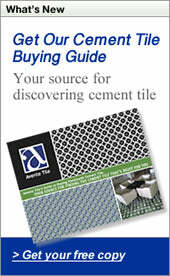 Avente Tile has a great selection of cement tiles. We stock many tiles for quick shipping. We love to talk tile! Contact us at 888.739.4972 (9-5 PST M-F) or at info@AventeLLC.com with questions about using cement tiles in your installation.